While the Nexus 5 offers high-end specs for a bargain price, many owners are looking for longer battery life. LG and Google chose to outfit the Nexus 5 with a 2,300-mAh battery to power a 4G-LTE smartphone with a 4.95-inch, 1080p display. The Korean manufacturer's LG G2 sports a 3,000-mAh battery. The coming Samsung Galaxy S5 has at least 2,800 mAh. So what gives? The smaller battery capacity on the Nexus 5 could have been selected by Google and LG to keep costs down, to provide a slimmer design, or more likely some combination of the two. We have five tips to improve the Nexus 5’s battery life, as well as five more if you are so inclined. But what if you just want to use your Nexus 5 without having to worry much about battery life? That is where a few manufacturers offer a simple, if pricey, solution: external cases that offer a full charge or more for the Nexus 5's battery, without having to plug in. Limefuel shifted gears from their core offering with the L28N5 Nexus 5 battery case, after having successfully funded a Kickstarter last year. All things considered, the company’s first foray into battery-packing smartphone cases is probably the best solution currently on the market, but using the Limefuel battery case has its drawbacks. Limefuel’s Nexus 5 case adds a significant amount of heft and bulk to the device, like any cover toting an external battery. This is a given, and it turns the Nexus 5 – which is surprisingly lightweight and sleek considering its large, high-resolution display – into quite the bruiser. Taking the Nexus 5 out of a jeans pocket was already tough, but trying to remove it with the Limefuel battery case on is nearly impossible. If you are sitting down, forget whipping your phone out of your pocket. Forget it. Alright – it's possible, but not recommended, especially if you lack the necessary clearance to do some serious wiggling. Instead, keep your Limefuel-wrapped Nexus 5 safely in a coat pocket, in your hands or on your desk at all times. You might also consider investing in a fanny pack, as I sometimes do. Sure, the rest of the world might think you're weird, but at least you’d have a place for your gadgets. Lest I digress, the Limefuel battery case also means that you can forget wirelessly charging your Nexus 5, due to the the added mass it places between the charger and wireless receiver. The Limefuel battery case works like similar cases for any other smartphone -- press the power button on its back once for a battery status light, with four LEDs to indicate its level of charge. Press and hold the power button for a few seconds to start and stop charging your Nexus 5. It’s simple, and it works well. 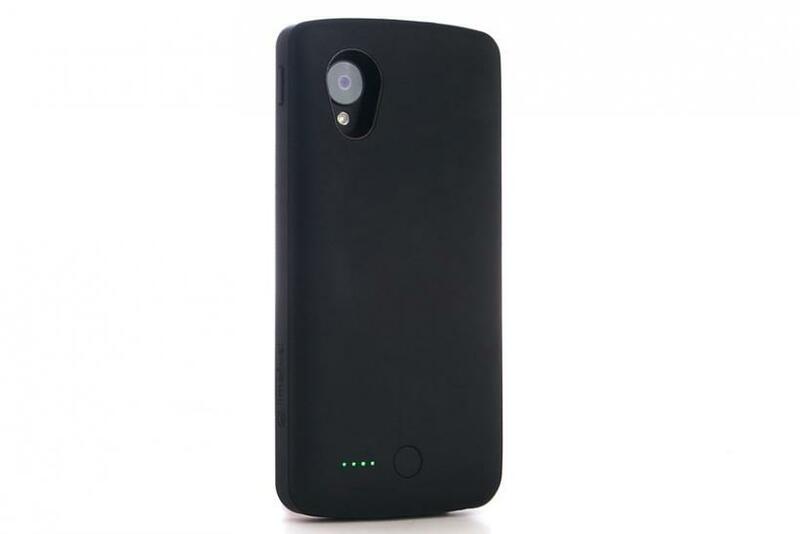 The Limefuel battery case charges the Nexus 5 quickly, thanks to 2.0A of output when connected. This allows it to charge about 50 percent faster than most other cases on the market, which offer only 1.0A of output, as well as many lower-end USB chargers. The Limefuel case itself takes about four hours to fully charge. I left it on the Nexus 5 and plugged in overnight. By morning, the case had a full charge, but the phone had reached only about 67 percent. It was more than enough power to last through the day, but the best thing to do is charge the phone and case separately. This is more work than simply plugging in before bed, or setting the Nexus 5 down on a wireless charging mat. However, not having to worry about a charge all day makes this extra step worth it. Limefuel also includes a USB cable with the battery case, as well as a USB-to-Lightning adapter. The Limefuel case’s soft-touch, rubberized plastic is easy on the hands – but its hard plastic interior is capable of trapping dirt and dust particles between itself and the Nexus 5. If you remove and clean it often, it should not be a problem – but extended use could result in the trapped junk rubbing against the Nexus 5’s body. If like me you made the unfortunate selection of the white Nexus 5, which does not feature the soft rubberized texture found on the black model, you may have minor cosmetic issues down the road. The test unit Limefuel provided to IBTimes for the purposes of this review also gained a blemish following a drop to the floor. The case’s rubber coating wore away, revealing the shiny plastic underneath, leading me to believe that it might not keep up very well over time. From streaming Spotify and using my Nexus 5 as a Wi-Fi hotspot during my morning commute, to playing “Clash of Clans” before bed, I did not have to worry about battery life with the Limefuel battery case. That is how the ideal smartphone experience should be, and Limefuel offers peace of mind to Nexus 5 owners concerned about battery life. On the other hand, the Limefuel adds bulk as well as an extra battery to charge at night. It does not offer the protection that such a sizable case usually affords in a drop, and it will not look pretty after a few months if you are hard on your phone. That being said, the Limefuel Nexus 5 case is not about aesthetics, its about utility. After all -- a smartphone is sometimes a toy, but often a necessary tool, and the Limefuel case easily offers more than 36 hours of extensive, worry-free usage. Compared to the only other Nexus 5 battery case on the market, the Limefuel offers a larger capacity (2,860 mAh) and a similar size. If you are looking for an external solution to your Nexus 5 battery life issues, there is nothing else available that beats it. That being said, ZeroLemon says it will release a “rugged” Nexus 5 battery case later in March that can be connected to another external battery, offering a 3,500 mAh + 3,500 mAh solution. ZeroLemon has been pushing back the release date for a few months now, so there is no telling if they will do it again. The ZeroLemon also looks pretty big, but can be had for $39.99.